The Icarus Project heads into its third calendar year with several key areas highlighted for wingsuit development to enable the aim of, ultimately, breaking world records. 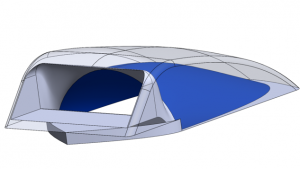 The main area the 2016-17 team have been researching into is the idea of impro ving the inlets to increase the overall glide ratio (Lift force per Drag force) of the wingsuit – a key design objective when aiming towards the most complete wingsuit design. Inlets are inherently necessary to inflate the suit at the start of the flight, giving it its fully formed and developed aerodynamic profile, however they also produce a large amount of drag that greatly affects the glide ratio. Therefore the team have been looking into ways of reducing the inlet impact on the airflow beneath the wingsuit when flying at a range of wingsuit Angles of Attack (relative angle to the horizontal). The second main area being looked at is the idea of keeping the flow attached to the suit as long as possible – known as Boundary Layer Re-Energisation. The boundary layer is the small fluid layer located at extreme vicinity to the wingsuit, o f which the flow starts off laminar (very smooth and predictable), but transitions towards turbulent (high drag and very random/unpredictable) at some point downstream. The aim of Boundary Layer Re-Energisation is to delay the transition, and move this transition ‘point’ as far downstream as possible, by in effect ‘sucking’ the air flow back towards the suit surface using the Coandă Effect principle. The team are currently performing numerous CFD tests in a bid to develop both of these innovative areas, with scale wind tunnel testing also lined up in the near future.